Following the Battle of Franklin on November 30, 1864, Roper’s Knob, along with the other Franklin fortifications, was abandoned by the retreating Federal army. 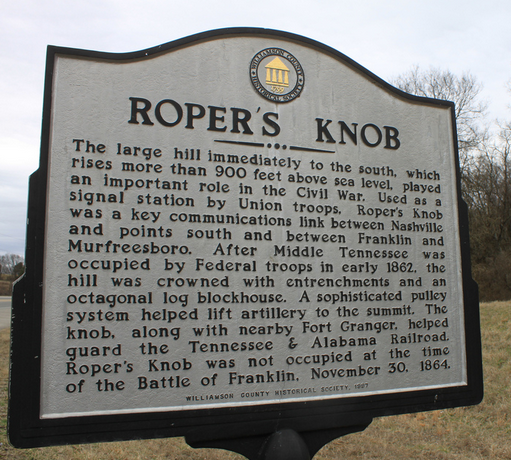 After the Union victory at the Battle of Nashville in mid-December, Roper’s Knob was again reoccupied by Federal forces until the end of the war. 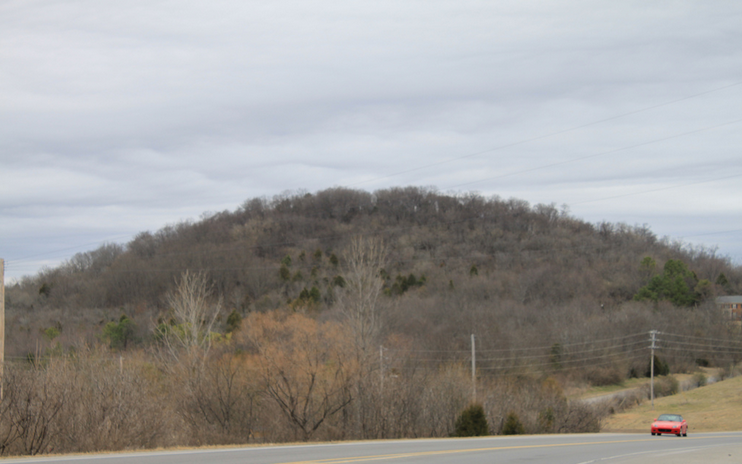 The outer entrenchment and redoubt at Roper’s Knob remain clearly discernible and well defined, and have only experienced natural erosion. The high peak, with its commanding view of the surrounding valley, combined with the high integrity of the earthworks, conveys a strong sense of its historical period. Today the 22-acre summit is owned by the State of Tennessee, and 36 acres of the south face was recently given to the City by the Heritage Foundation. An archaeological survey has been conducted by the State, but no interpretive plan has been prepared. 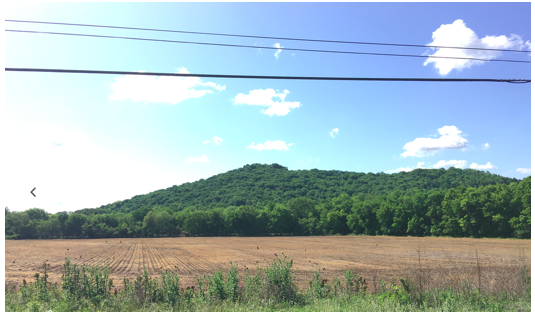 The property is not open to the public, although Save The Franklin Battlefield (STFB) has gained permission to lead tours to the summit on several occasions. View facing east. Roper’s Knob on left. Shute’s Knob on right. The main water spring in 1863 was on the south slope of Shute’s Knob. Scot Butler served in the 33rd Indiana Infantry and the U.S. Signal Corps. By 1863 he was in the Signal Corps and stationed in Franklin, Tennessee. The following account is taken from“Affectionately Yours: The Civil War Home-Front Letters of the Ovid Butler Family.” Edited by Barbara Butler Davis. 2004. 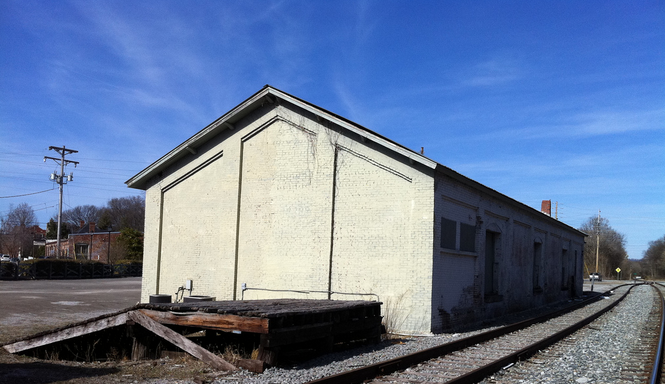 The Tennessee and Alabama Railroad Freight Depot was constructed ca. 1858 by the Tennessee and Alabama Railroad Company shortly after it built its line through Franklin. The brick freight depot was constructed near the busy intersection of South Margin Street and Second Avenue, South in a rectangular design common among antebellum depots in Middle Tennessee. These structures were typically one-story buildings of brick construction, with thick walls and a broad overhanging gable roof. Built for the purpose of shipping and receiving freight, the building had an open floor plan with the northern end of the building reserved for office space. Freight doors were located on either side of the building leading to the track and loading areas for easy transfer of goods. Soon after Union forces occupied Middle Tennessee in 1862, railroads were utilized as vital links in moving troops and supplies through the region. During the war years, the freight depot in Franklin would have been a busy hub of activity as supplies and munitions were shipped along the rail line. The depot was likely one of many buildings in the community converted into a temporary hospital following the Battle of Franklin, as local historians have reported. The freight depot also continued to house ammunition during this time, and Confederate troops attempted to burn the building as they scrambled to evacuate Franklin on December 18, 1864. Historian Wiley Sword notes that “at the last minute, Lee’s men set fire to the freight house in town, a building containing seven wagonloads of ammunition.” Fortunately a devastating explosion was avoided as a citizen rushed to throw buckets of water on the blazing roof. Following the return of the Union army to Franklin, immediate efforts were made to evacuate the wounded to Union army hospitals in Nashville. 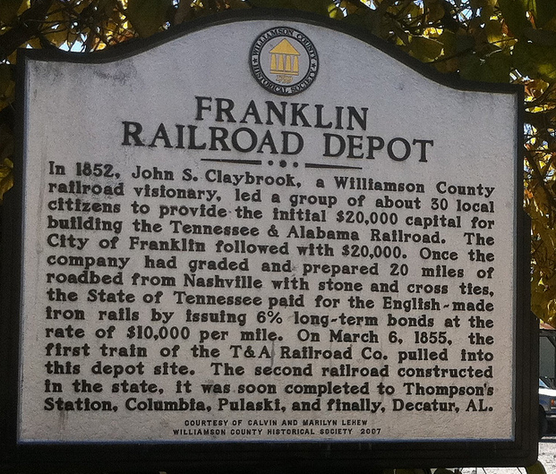 A history of the U.S. Army Medical Department records notes: “Trains evacuated all the wounded from Franklin and other communities back to Nashville as soon as they were in a condition to be moved and the track had been repaired.” After the Civil War, the Tennessee and Alabama Railroad Freight Depot went back to its original purpose as a shipping and receiving facility. Text source: Franklin Battlefield Preservation Plan, n.d.